First, drivers will love how comfortable the seven-person seating in this vehicle is. It allows seven adults to comfortably enjoy more than 83 cubic feet of space. 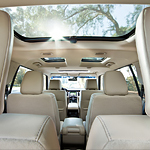 If you fold the seats down, this SUV instantly becomes full of cargo space to help with moving and home projects. Also, the PowerFold third row of seats has never been easier to put down to help easily load and unload large bulky items from the car. Then, once you're done, simply return the third row of seating to its original position with ease.